Little Cat catches the bus home from school everyday with her big sister. It is always the same, the bus goes and stops and eventually her sister tells her it’s time to get off. Cat is the smallest person on the bus so doesn’t get to sit in the special seat up front or with the big kids her sister sits with. Then one day her sister is sick and Little Cat has to catch the bus on her own. A charming little slice of life story. Cat’s story is simply told, yet full of detail and easily relatable. 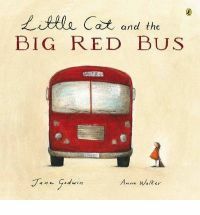 The illustrations are simple and inspire whimsy, it manages to take you back to a simpler time.